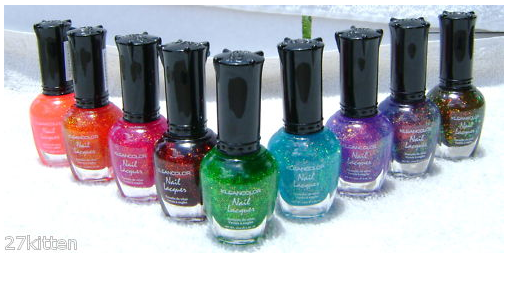 After seeing this post from Samarium's Swatches, I knew I needed Kleancolor's Chunky Holo Black. A single bottle on Amazon was ridiculous, with the shipping exceeding the price of the damn bottle by more than 100%. So I checked eBay, which I haven't used in ages. I spotted this set, and knew I needed it. Sorry, no time to add it to the Christmas list...I needed it now! The layering possibilities are endless, and I can't wait to try a bunch of different options out. Now if I could only get my hands on Clairvoyant!! I want that whooole set! :D Lol. I have the whole set - and love them! I'm not sure if you've purchased the Kleancolors yet, but beautyjoint.com has 'em for 1.75$ each. I'm not sure how much shipping is within the US, but I found that the shipping to Canada is very reasonable. :D I had a big fan girl moment just now! You were at my blog and totally know I exist! Somehow I just saw this now-almost a year later haha. Excited nonetheless!